US pop diva Mariah Carey has been drawn into a spat involving a Kiwi musician who claims he has not been paid royalties for her use of music he helped write. Auckland musician Dominique Leauga arranged, co-produced and played many of the instruments on eight of the 13 songs on top Kiwi vocal duo's Adeaze's chart-topping debut album, including the platinum single "A Life With You", for which he is registered as a co-composer. The song, which reached No 5 on the local charts in 2003, was used by Mariah Carey as a sample on the song "Your Girl" from her last album The Emancipation of Mimi. The album sold 7.7 million copies - the world's second biggest-selling record last year, behind Coldplay's X&Y. Sampling, takes a piece of music from an existing song and incorporates it in a new work. Leauga claims he has been cut out of receiving any financial benefits from Carey's use of the song. "I am just a simple Samoan guy who makes music and loves music - the music business seems to get very complicated when there is big money involved... I don't understand how Mariah Carey can put a track on her album which has my music on it and I am not getting any money for it." Leauga's lawyers are talking to Adeaze's record label, Dawn Raid, in an attempt to claim his share of the royalties. Universal Music Publishing, which, with Dawn Raid, owns the master recordings and licensed Carey's use of the sample, has enlisted British forensic musicologist Peter Oxendale to determine whether Carey's use of the sample breached the licence agreement and constituted a copyright infringement. 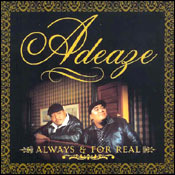 Leauga is a long-time friend and former flatmate of Adeaze brothers Nainz and Viiz Tupa'i. The brothers are credited as songwriters on the album, but Leauga is also registered with the Australasian Performing Right Association as a co-composer, and has been receiving songwriting royalties from the track. A statement his agent obtained from Adeaze says he contributed to the track's writing, and was granted a 20% share in this and other songs he worked on. Dawn Raid CEO Andy Murnane refused to discuss details of the dispute with Leauga, saying it was "a legal matter... I'm confident it will be resolved pleasantly". An email obtained by the Sunday Star-Times shows Murnane believed only Adeaze's unaccompanied vocals were to be sampled by Carey, but after checking the contract, he determined Carey had permission to use the instrumentation as well. An a capella version of "A Life With You" had been registered with APRA, naming the Tupa'i brothers named as the sole composers. But it appears Carey sampled the full instrumental version of the track, including Leauga's arrangement and performances. Leauga's agent, Paul Harvey, said Oxendale had given him an initial verbal opinion that Carey's song was not an original composition, but an adaptation of the Adeaze song. Murnane would not say how much money had been received in royalties for the sample. "It was an amazing opportunity for two local boys to be on Mariah's record." The Tupa'is' manager, Adee Keil, and Carey's record company, Universal Music, did not return calls.